This little black bird is looking for a name. We have a little black bird who has a simple request. Will you please give me a name? Our Dominique is called Baby Girl. And the Olive Egger’s stage name is Gigi. 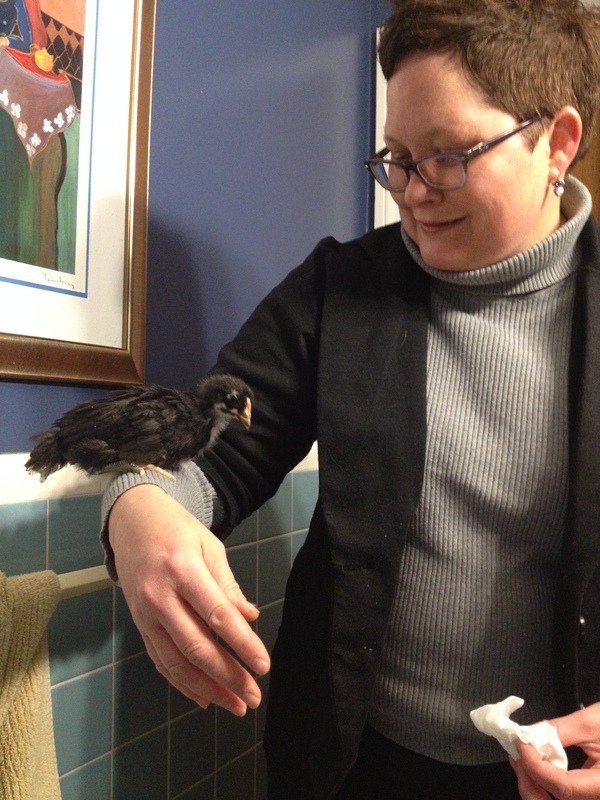 Jilli and the baby Marans chill in the loo. That leaves the Black French Copper Marans. 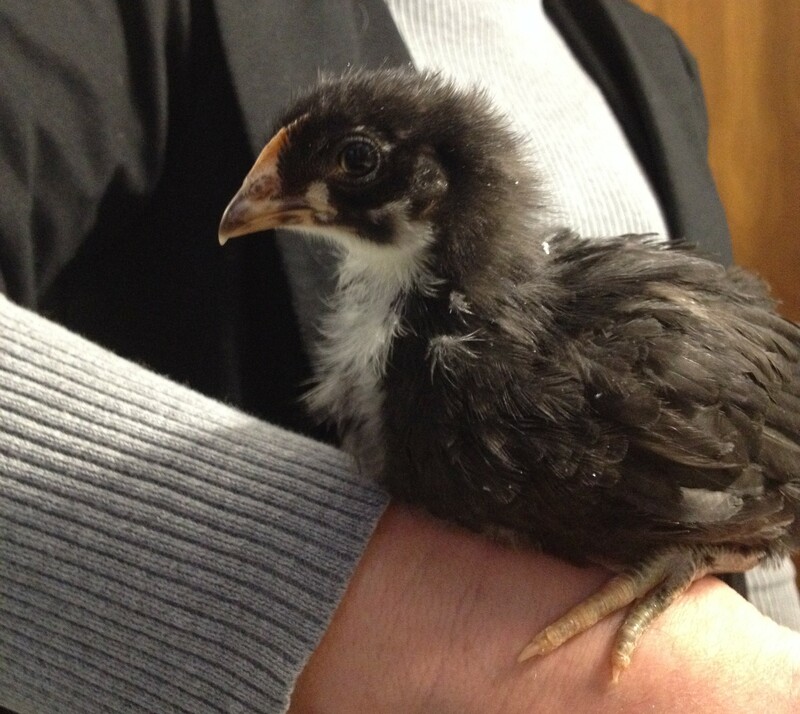 After discussing this dilemma with Matt, we both agreed that we would let our readers name this little chick. This bird is shy, almost stoic. 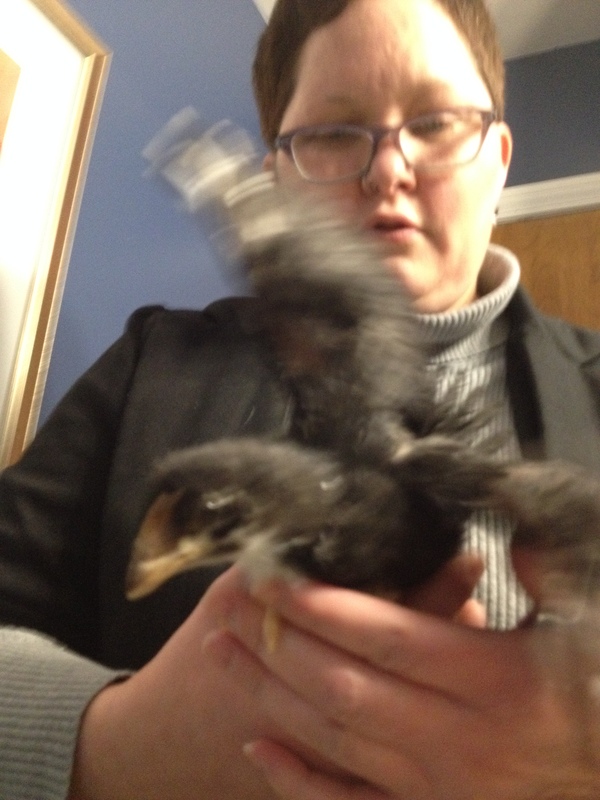 While she’s getting better at not running from my hands, she’s still the most flighty of the chicks. Black French Copper Marans originated in and are named after Marans, France. Of all chickens, these birds lay the darkest brown eggs, and some chefs in France will only use Marans eggs. Fictional character James Bond’s affection for Marans eggs, featured in the 007 agent book series by Ian Fleming, made the chocolate-colored egg popular in England. Since our Marans is such a nervous nellie, I was unsure how she would handle a trip up to the bathroom for our little photo shoot. At first, she flapped her wings wildly. Since we had closed the bathroom door, I let her stretch her feathers, knowing she couldn’t get in any trouble. Then, as soon as she settled in, she pooped in my hand. That really seemed to calm her down. She was a real champ for the rest of the shoot, mugging for Matt’s iPhone. Please take a moment, and send us your name suggestions. Once we have a solid list, I’ll post another poll, and let ya’ll vote on something more permanent. May I suggest Mimi! Cute little gal! Awwe, thanks so much. She is a cutiepie!